I was working in Saintfield that afternoon which is a little closer than usual so I was able to get down to Ott car park and set off at around 6.30pm. I was heading up Ott track and cutting across behind Ott mountain toward Slieve Muck. 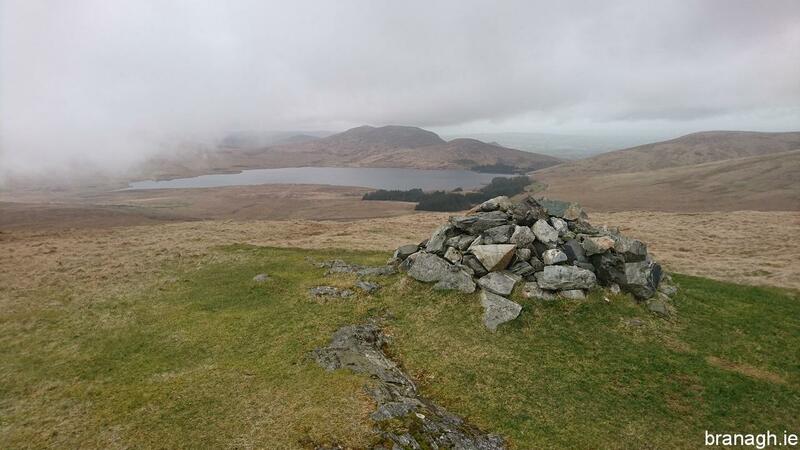 It was the same route I had taken the time I had camped on Slieve Muck summit but this time I was going beyond the summit and heading for the southern peak. 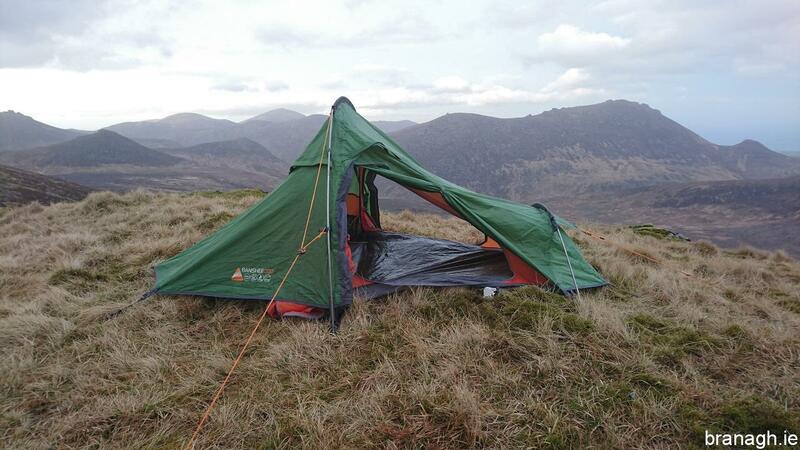 The weather was clear which was a nice change compared to recent camps although there was a stiff westerly wind. It was blowing at about 35mph at that stage but was due to decrease to about 28mph overnight. 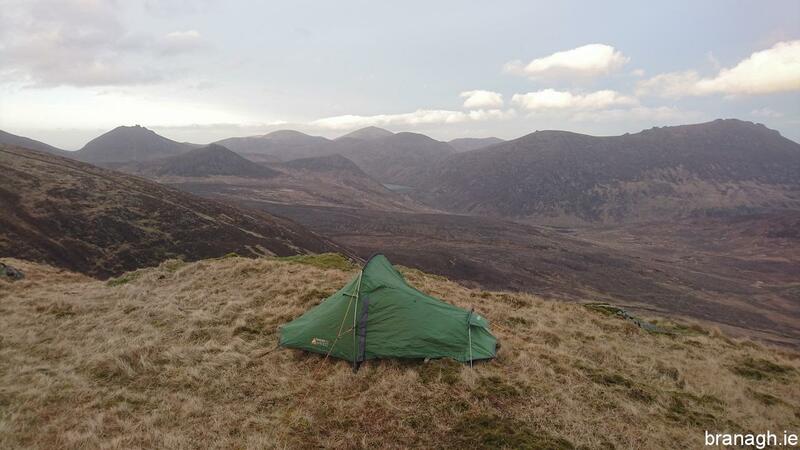 My usual limit for camping on an unsheltered peak is 20mph but I was really wanting to camp of the southern peak of Slieve Muck where there was no Mourne Wall for shelter. The closer I got to the summit the more I thought it would not be possible to camp on the unsheltered southern peak due to wind so I was beginning to think that I would just camp on the summit for the night, sheltered by the Mourne Wall where I had camped previously. When I reached the summit I still had a good bit of daylight left so I decided to hike on to the southern peak to check it out. Even if I wasn’t to camp there this time it would be good to know what the ground was like for a future camp. As I hiked on to the southern peak I noticed that there was a dip just to the east of the summit cairn, above the cliffs. This dip was completely sheltered from the westerly and a perfect site for me to camp. When I pitched the tent I realised that I had forgotten to dry it out after the previous camp on Slieve Corragh but I was able to do it now while enjoying the views. 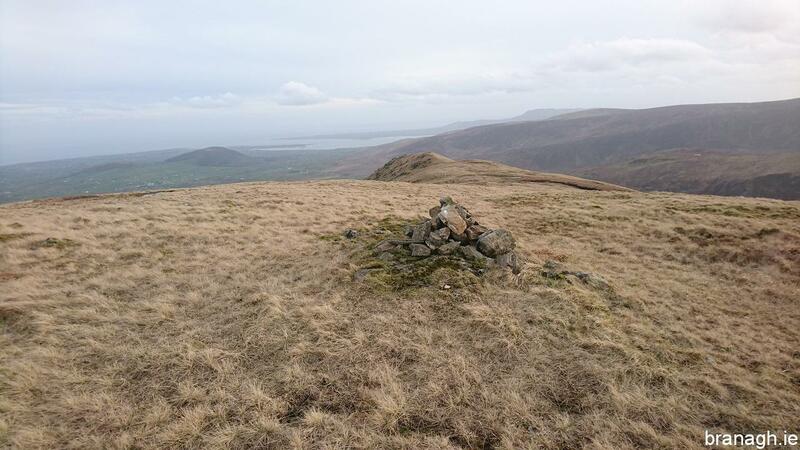 The small cairn on the southern peak of Slieve Muck. Perfect spot above the eastern cliffs, sheltered from the westerly wind. The next morning there was a little low cloud and patchy light rain but otherwise mostly clear so I took a hike over Carn Mountain and Ott Mountain on the way back to the car. The ground was very wet in places and I was reminded of the importance of good waterproof boots and gaiters. Looking over Spelga from Ott summit. 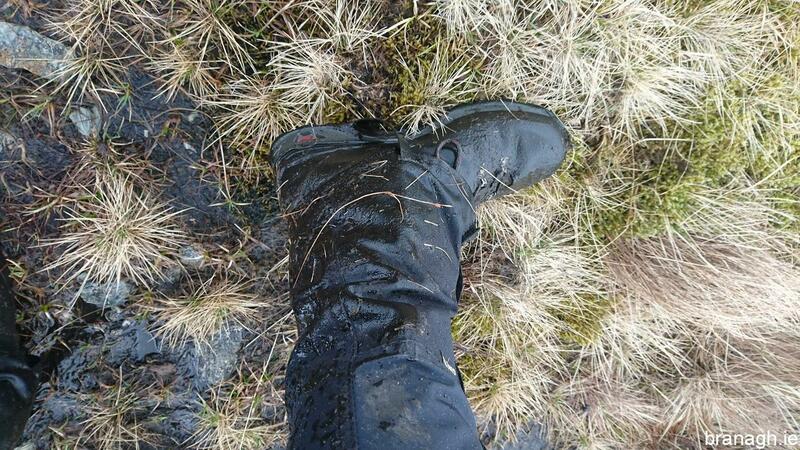 The importance of waterproof boots and gaiters.